All motorcycle courses take place on the Wisconsin Rapids Campus. Less than 30 days prior to the start of your motorcycle class, you must complete the mandatory online Motorcycle Safety Foundation Basic eCourse. Course information can be found in the right hand column of this page. IMPORTANT: To participate in a motorcycle course at Mid-State, you must print and present a copy of your Basic eCourse completion certificate to the instructor at the beginning of the first class. If you do not have your certificate copy, you cannot participate in the class and you will not be issued a refund. Mid-State’s motorcycle and scooter safety courses are for beginning and experienced motorcyclists which include six hours of classroom instruction and ten hours of on-cycle riding. Instructors are veteran riders trained and certified by the Motorcycle Safety Foundation and approved by the Wisconsin Department of Transportation. Motorcycles and scooters are provided by local dealerships. 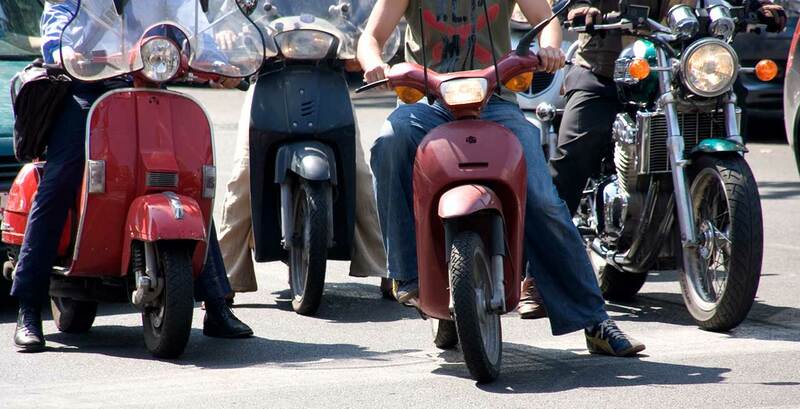 After successfully completing the basic rider course or scooter basic rider course, you will receive the MV3575 Motorcycle Skills Test Waiver Authorization to take to the DMV to receive your Class M endorsement on your driver’s license. Note: Classes meet rain or shine. For a full refund, cancellation is required at least 48 hours prior to class. An instruction permit (temps) is not required to take the Basic Rider Course. However, persons less than 18 wishing to obtain an instruction permit (temps) from your local DMV Office prior to completing the course need to obtain a MV3575 form available in-person from our office. This is your proof of enrollment required by the DMV. Please call (715.422.5474) to obtain the MV3575 form. Please review the Required Motorcycle Riding Gear to be prepared for class. Mid-State provides a packet of class materials for all basic rider and scooter classes (which is mailed approximately 2 weeks prior to the start of class). All courses are subject to cancellation due to low enrollment. You must be a Wisconsin resident 15 ½ years of age or older. Placement is not guaranteed. Stating a second choice on the Registration Form is recommended. Payment in full at the time of registration is required. Mail – Register by completing, printing and mailing the online registration form to the Wisconsin Rapids Campus. In Person – Stop by the Mid-State Campus nearest you to complete a Registration Form. Due to expected high volume, registrations will not be accepted by phone.